The X-30 National Aero-Space Plane (NASP) was an attempt by the United States to create a viable single-stage-to-orbit (SSTO) spacecraft. The project was cancelled prior to the first craft being built. NASP originated from a Defense Advanced Research Projects Agency (DARPA) project called Copper Canyon that ran from 1982 to 1985. In his 1986 State of the Union address, President Ronald Reagan called for "...a new Orient Express that could, by the end of the next decade, take off from Dulles Airport, accelerate up to 25 times the speed of sound, attaining low earth orbit or flying to Tokyo within two hours." 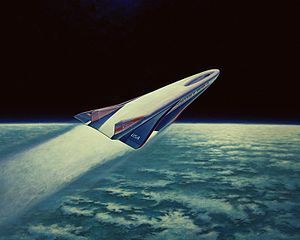 Previous research had suggested a maximum speed of about Mach 8 for scramjet based aircraft, as the vehicle would generate heat due to atmospheric friction which would thus lose a great deal of energy. The Copper Canyon project showed that much of this energy could be recovered from passing hydrogen over the skin and carrying the heat into the combustion chamber; Mach 20 then seemed possible. The result was a program funded by NASA, and the United States Department of Defense (funding was approximately equally divided between NASA, DARPA, the US Air Force, the Strategic Defense Initiative Office (SDIO) and the US Navy). McDonnell Douglas, Rockwell International, and General Dynamics competed to develop technology for a hypersonic air-breathing SSTO vehicle. Rocketdyne and Pratt & Whitney competed to develop engines for the new craft. In 1990, the companies joined forces under the leadership of Rockwell International to jointly develop the craft in order to deal with the substantial technical and budgetary obstacles that were encountered. Development on the X-30, as it was now designated, continued until 1993, when it was finally terminated amid budget cuts and ongoing technical concerns. 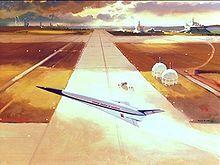 Picture - 1986 artist's concept of the X-30 on liftoff. The X-30 configuration was basically a highly integrated engine. The shovel shaped forward fuselage generated a shock wave to compress air before it entered the engine. The aft fuselage formed an integrated nozzle to expand the exhaust. The engine in between was intended to be a scramjet engine. At the time, no scramjet engine had been successfully tested. 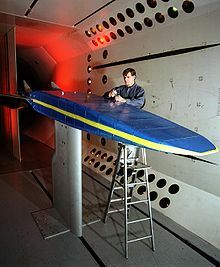 The aerodynamic configuration was an example of a waverider. Most of the lift was generated by the fuselage through a phenomenon called compression lift. The "wings" were small fins that provided trim and control. This configuration would make for efficient high-speed flight, but would have made take-off and slow-speed flight difficult. Temperatures on the airframe were expected to be 1800 �F (980 �C) over a large part of the surface, with maximums of over 3000 �F (1650 �C) on the leading edges and portions of the engine. This required the development of high temperature lightweight materials, including alloys of titanium and aluminum called gamma and alpha titanium aluminide, advanced carbon/carbon composites, and titanium metal matrix composite (TMC) with silicon carbide fibers. Titanium matrix composites were used by the McDonnell Douglas team to create a representative fuselage section called "Task D". The Task D test article was four feet high by eight feet wide by eight feet long. A carbon/epoxy cryogenic hydrogen tank was integrated with the fuselage section and the whole assembly, including highly volatile and combustible hydrogen, was successfully tested with mechanical loads and a temperature of 1500 �F (820 �C) in 1992, just before cancellation of the program. Despite progress in developing the necessary structural and propulsion technology, NASA still had substantial hurdles to overcome. The Department of Defense wanted it to carry a crew of two and even a small payload. The demands of being a man-rated vehicle, with the necessary instrumentation, environmental control system, and safety equipment, made X-30 larger, heavier, and more expensive than was required for a simple technology demonstrator. The result was a cancellation of the X-30 and a move toward a more modest hypersonic program that culminated in the unmanned X-43 "Hyper-X", which is virtually an unmanned scaled-down X-30. A large, detailed scale mock up of the X-30 was built by engineering students at Mississippi State University's Raspet Flight Research Lab in Starkville, Mississippi. The mock-up is currently on display at the Aviation Challenge campus of the U.S. Space Camp facility in Huntsville, Alabama. Stage 1: 1 x X-30. Rockwell X-30 Pictures and Rockwell X-30 for Sale.